Hormone therapy is prescribed by a medical oncologist for women and men diagnosed with hormone receptor-positive breast cancer. It is prescribed to slow or stop the growth of hormone-sensitive tumors by blocking the body’s ability to produce hormones or by interfering with hormone action. When taken by women and men with early-stage breast cancers, it helps reduce the risk of getting a recurrence of the original breast cancer or getting a new primary breast cancer. Given the importance of hormone therapy, helping women and men manage the side effects of their hormone therapy is critical to remain on it for the prescribed five years or more. Tamoxifen is a drug used to treat ER-positive early-stage breast cancer in premenopausal and postmenopausal women as well as in men. Tamoxifen is approved by the FDA and has been in wide use for over 30 years. Aromatase Inhibitors (AIs) are a class of drugs used in the treatment of breast cancer in postmenopausal women and gynecomastia in men. They include Anastrozole (Arimidex), Letrozole (Femara), and Exemestane (Aromasin)..
Tamoxifen or one of the aromatase inhibitors are the hormone therapy drugs most often prescribed for people with early-stage hormone receptor-positive breast cancer following the completion of their active treatment (surgery and chemotherapy/radiation). Some hormone therapy drugs have mild to moderate side effects, while others have side effects that impact on a survivor’s quality of life. Bone and joint pain, which is a major complaint of many taking a hormone therapy, is a side effect that definitely causes problems in everyday living. Tamoxifen may increase the risk of blood clots and uncommonly, uterine cancer. Aromatase inhibitors can lead to bone loss (and people should consider having a bone density test done at the start of therapy). Since tamoxifen has anti-estrogen effects on breast cells but estrogen-like effects on bone, it doesn't lead to bone loss like tamoxifen. Other very uncommon side effects may occur as well. Is Tamoxifen or an Aromatase Inhibitor Such as Arimidex More Effective? Several studies have been done comparing the different aromatase inhibitors to tamoxifen. The Arimidex, Tamoxifen, Alone or in Combination (ATAC) Trial compared the benefits and safety of Arimidex 1 mg with tamoxifen 20 mg given orally every day for five years, as adjuvant treatment for postmenopausal women with early-stage breast cancer. However, bone and joint pain were reported more frequently on Arimidex than on Tamoxifen. Bone loss and arthritis also occurred more frequently in the first 2 years of taking Arimidex. For many women, the daily occurrence of bone and joint pain is their biggest complaint. The severity of this pain and its impact on daily living causes some women on Arimidex to stop taking it. 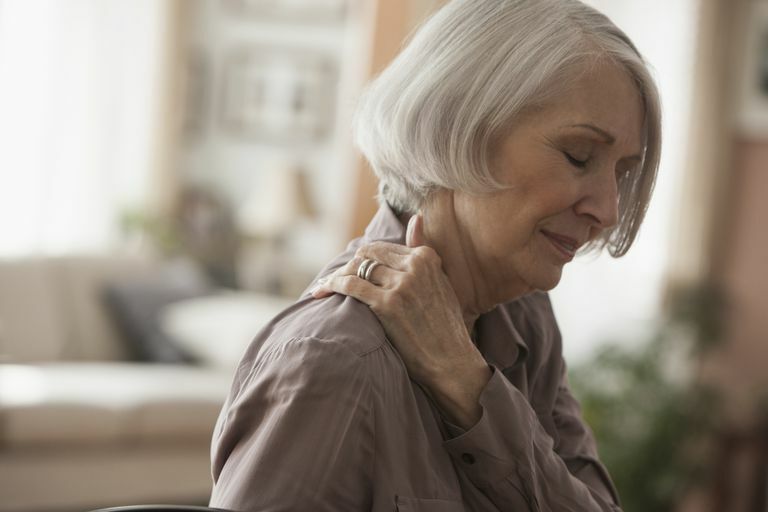 Most women experiencing bone and joint pain reported having stiffness and pain, upon awakening, in their hands, hips, back, knees, feet, and shoulders that made it difficult to perform daily activities and work-related tasks. Joint pain often occurs in the knees, back, the ankle, and foot as, well as the hips. Carpal tunnel syndrome was a frequent complaint. Despite the pain, many were able to get pain relief from taking non-steroidal anti-inflammatory drugs. Small studies have shown that women taking dietary supplements that include vitamins, glucosamine and chondroitin, vitamin D, and omega fish oils, on a regular basis experienced some relief from bone and joint pain. Acupuncture has also been demonstrated to help relieve bone pain. Women taking Arimidex or another aromatase inhibitor are encouraged to regularly participate in a weight-bearing exercise. Given that aromatase inhibitors are known to cause muscle and joint pain, it is important to talk to your oncology team if you develop this side effect. Your team will want to evaluate the level of your pain, refer you for a bone density test if you haven't had one, and recommend exercises, activities, and possible use of medication to reduce your pain level. The results of a small study, presented at the San Antonio Breast Cancer Symposium in 2013, indicated that survivors taking an aromatase inhibitor who participated regularly in a course of exercise for a year had a 30 percent decrease in their worst pain and a 20 percent decrease in the severity of their pain. These reductions in pain resulted in an increased ability to perform routine activities of daily living. Women in the study who didn’t follow an exercise program for a year experienced a 5 percent increase in pain and in the severity of their pain. Speaking from personal experience, the bone and joint pain of Arimidex, the aromatase inhibitor prescribed for me following my 2nd breast cancer, was more difficult to manage than that of Tamoxifen, which I took following my 1st breast cancer. The pain from Arimidex was almost exclusively on my feet, and usually a constant, even waking me from sleep. It interfered with my favorite form of exercise, walking 2 miles a day. The pain with tamoxifen was more diffused throughout my body and was more like an ache that came and went. Tamoxifen’s biggest physical challenge was muscle cramps in my calves. I managed the pain from Arimidex and the cramps of tamoxifen by doing daily gentle exercises, swimming 3x a week, and trying to walk at least a mile each day. Sturdy shoes with arch support and a 1-1/2 inch heel made a big difference in my ability to walk with some degree of comfort. Not unlike the pain and stiffness of arthritis, the foot pain would eventually decrease as I continued to walk, and by the end of my walk, I was almost pain-free. Warm foot baths and the occasional foot and leg massage also helped. Hormone therapy works and it does reduce the incidence of recurrence. Arimidex is being prescribed more and more often than tamoxifen since it has proven to be more successful than tamoxifen in preventing a recurrence. If you are taking an aromatase inhibitor and are experiencing bone and joint pain, share what you are experiencing with your oncology team. You may be advised to participate in an organized exercise class in your community or join a walking group. Your medical oncologist can advise you about which pain relievers you can safely take, as even over the counter medications have side effects. What Drugs Interfere With Tamoxifen?